PowerPoint user? We have you covered. Open, view and edit your PowerPoint presentations with Zoho Show. 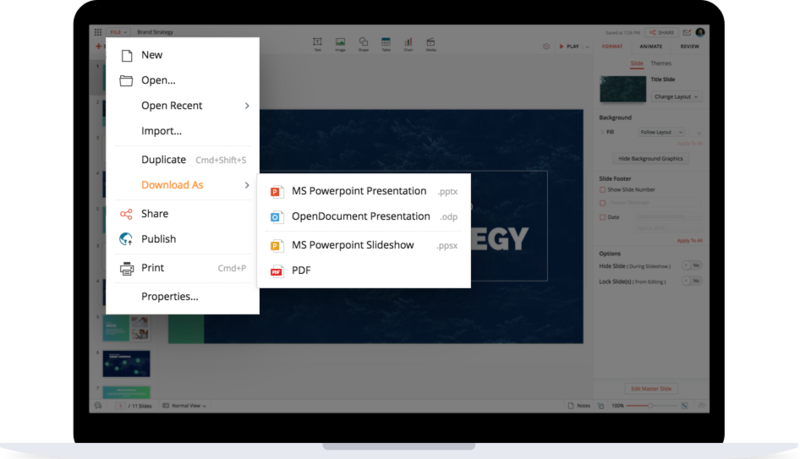 If you have a PowerPoint presentation, you can now import it to Zoho Show and benefit from the best of both the online and desktop features. Stay with PowerPoint and still benefit all the features of Zoho Show. It's easy to import your PowerPoint files, .PPT or .PPTx files and present online. Additionally, you can also use Zoho Show to import files as an URL. File size restrictions can also sometimes be a hindrance to efficient performance. Hence, we let you import PowerPoint files up to a size of 100 MB - meaning richer presentations!! A presentation is a carefully crafted piece of art. Every word and image in the slide conveys a meaning. And like every piece of art, change in any of these elements, absorbs life out of the canvas. Zoho Show ensures hassle free import of your PowerPoint presentations. Your formatted documents stay exactly as they were while you created them - no faulty margins, misplaced numbers or unruly images! 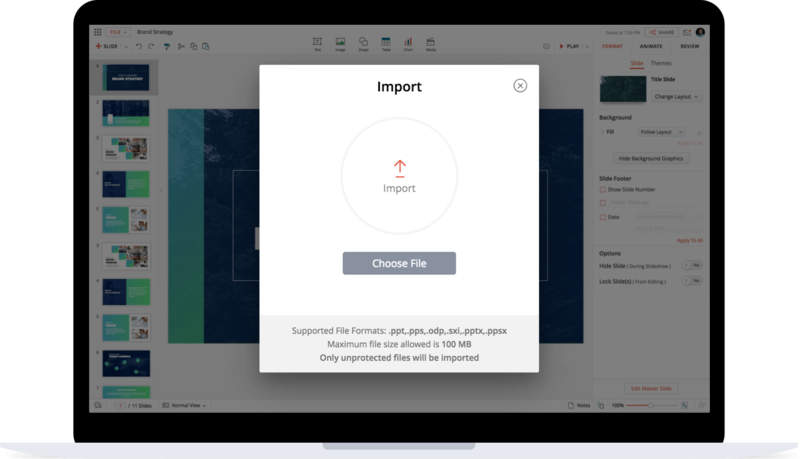 Here's a list to help you understand how well Zoho Show supports PowerPoint features during a document import. Learn more about PowerPoint file compatibility in Zoho Show. Users who wish to only experience and benefit from Zoho Show's online collaborative capabilities - including ability to create, edit and review slides together, can always convert your documents back by exporting it as a PowerPoint file(.ppt or .pptx). No headache. Back to the way you wanted it! Professionals use desktop presentations and drain a lot of time trying to discuss, draft and put together a bundle of slides. Harsh reviews, uncoordinated edits, and multiple iterations later, you are left with a mess to clean up!! We say, take a break. Spend a couple of minutes migrating your file to Zoho Show and experience the difference! You will see more smiles at work.